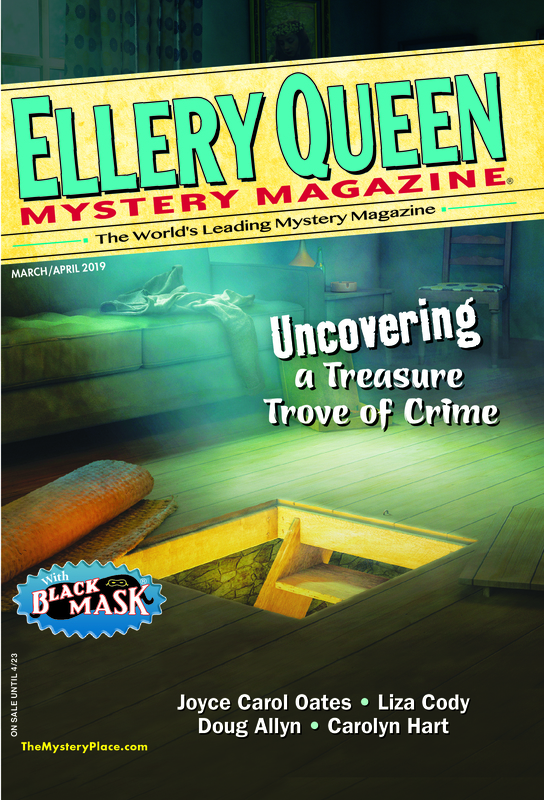 The last week in April/first weekend in May is always our busiest time at the Dell mystery magazines. This year, it all got going a day earlier than usual. On Tuesday, April 28, we hosted a bagel breakfast in our new offices on Wall Street for those of our nominees and Readers Award winners who’d come into town in advance of Wednesday’s Edgar Allan Poe Awards. As always, it was a cozy, comfortable gathering, which began at nine A.M. —and continued into midafternoon! While AHMM editor Linda Landrigan and I were whiling away the day in pleasant conversation, senior assistant editor Jackie Sherbow was representing us at the annual Edgars Symposium. We joined her in early evening for the MWA’s Agents and Editors Cocktail Party, where we were pleased to run into many of our magazines’ contributors. Wednesday, of course, was the big day. Our annual cocktail party, at which we present the EQMM Readers Awards, and honor the Robert L. Fish Award winner and nominees for the Edgar and Agatha awards, was held in the afternoon. Third-place Readers Award winner Miriam Grace Monfredo (“The Tavern Keeper’s Daughter, December 2014) was unable to travel from Rochester for the occasion, unfortunately, but second- and first-place winners Marilyn Todd (“Blood Red Roses, September/October 2014) and Doug Allyn (“The Snow Angel, January 2014) were present, along with Fish Award winner Lauren James (a.k.a. Zoë Z. Dean). Doug Allyn was also a nominee for the Edgar for best short story for his Readers Award winning tale, as was Brian Tobin, whose work commitments prevented him from attending, for “Teddy,” EQMM May 2014. In attendance at the party were several other Edgar nominees in other categories. They included John Floyd, for a story in The Strand, Francis M. Nevins in the critical/biographical category, Steve Hockensmith for best juvenile mystery, and Charles Ardai, winner of the Ellery Queen Award. You’ll find photos of most of them in the following selections from the cameras of Carol Demont and Jackie Sherbow in NYC, and Josh Pachter and Tara Laskowski at Malice. The Edgars banquet this year was a star-studded event, with Sara Paretsky, incoming MWA President, as master of ceremonies and Stephen King presenting the Ellery Queen Award and then claiming the Edgar for best novel. Zoë Z. Dean’s Robert L. Fish Award (for “Getaway Girl” EQMM November 2014) was presented by past Fish Award winner Ted Hertel. The short-story Edgar went to Gillian Flynn for “What Do You Do?”, from the anthology Rogues. Congratulations to winners and nominees alike! With the events in New York over, many writers, editors, and agents went on to Bethesda, Maryland for the Malice Domestic Convention. I had the pleasure, while there, of catching up with many of my favorite authors, including Charlaine Harris, Toni and Steve Kelner, Dana Cameron, Martin Edwards, Ann Cleeves, Josh and Laurie Pachter, EQMM’s fabulous reviewer (and author) Steve Steinbock, Doug Greene, Margaret Maron, Dorothy Cannell, Terrie Farley Moran, and many others, not least—and saved for last because he was this year’s short-story Agatha Award winner (for his November 2014 EQMM story “The Odds Are Against Us”)—Art Taylor, along with his wife author Tara Laskowski. Unfortunately, I was unable to attend the short-story panel moderated by my colleague at AHMM, Linda Landrigan, but I understand it was an interesting and lively session. Congratulations to Art Taylor and all of the other Agatha Award winners, including the winner for best first novel, Terrie Farley Moran, who got the idea for the setting for that winning book from Dell Magazines’ own Christine Begley, Vice President for Editorial. This entry was posted in Awards, Conventions, Magazine and tagged agathas, agents, authors, award, bethesda, convention, crime, edgars, editors, Malice Domestic, maryland, md, MWA, mystery, new york, NYC, publishers. Bookmark the permalink. Thanks for the great recap here! While it’s been difficult for me to get to the Edgars in recent years, I even more miss the pre-Edgars cocktail party that you host, which was always a great time to see old friends and make new ones. These photos remind me why I need to find a way to get up there next year! We’d love to see you there next year, Art!! Tara too!! Thanks for these wonderful memories. I am especially thrilled to have a picture of me with my pal Chris Begley.